It's hard to believe the history of this sparkling house. Architect Mary Ann Gabriele Schicketanz transformed the old entryway into a private courtyard, replacing the door and window with a sleek glass slider. She removed the fiberglass panels and constructed a reclaimed wood barrier to separate the sitting area from the new front door on the opposite side. A high concrete wall also encloses it. “I love that you can be right on the street without having any sense the street is there,” Schicketanz says. When Schicketanz bought the 2,054-square-foot house for $650,000 in 2012, it was dark and dilapidated, sinking two inches out of plumb toward the creek. Unsightly fiberglass panels lined the front door walkway. Plus, there was a woodpecker problem. “The plywood on one side had a million holes in it,” she recalls. “When we opened the walls inside, I don’t know how many pounds of acorns poured out.” All in all, she spent about $270 per square foot to completely renovate the structure. In the original east-facing living room, the light was partially blocked by a poorly located fireplace. The house is set on a forested hill, which means the backyard—though scenic—is too steep to enjoy. It’s also perpetually shady. Schicketanz wanted somewhere she could soak in the sun, so she added a roof deck. “It’s really the only usable, large outdoor space I have,” she says. This house in Carmel-by-the-Sea is enlivened by its very red kitchen cabinetry. By knocking down a dividing wall, the architects opened the kitchen up to the rest of the living space. IKEA red lacquer cabinetry and Caesarstone countertops replace dingy cupboards and old-fashioned finishes. Stainless steel appliances help ground the airy, open space. Guests now dine on a table from Coup d’Etat in the space where the residents used to enter the house. The dining room feels much larger than it actually is, thanks to a ten-foot-wide sliding glass door that opens onto a second, outdoor lounge. The updated master bathroom features white concrete floors, painted wood walls, and veneer plaster ceilings. Light streams in through the original window, and an added sliding door opens to an outdoor shower. A single Washplane sink by Omvivo sits beneath the mirror, with additional faucets for the shower and Duravit bathtub by Hansgrohe. A stool from Roost holds bath essentials. On the house’s lower level, Schicketanz’s guests have a bathroom complete with a steam shower to themselves. Anodized aluminum windows pop against white subway tile from Waterworks. The vanity is from Ikea and the fixtures from Hansgrohe. “When you have a tiny house, having outdoor spaces off a room can make a big difference,” Schicketanz says. 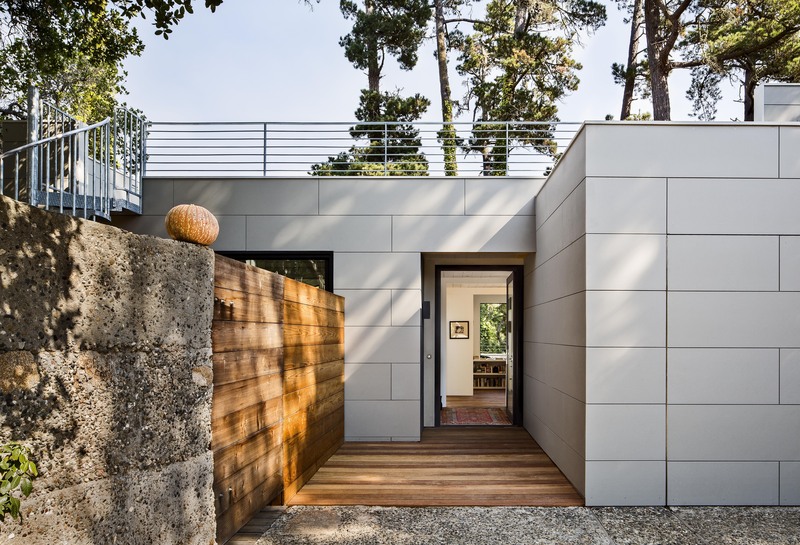 Luckily, each room already had its own deck, which the architect simply refurbished by installing concrete floors and galvanized stainless steel railings. Finding undeveloped land in the idyllic Californian city of Carmel-by-the-Sea is next to impossible. So when architect Mary Ann Gabriele Schicketanz decided to leave rural Big Sur, where she had lived for 21 years, and move to town, she looked for a good lot with a house she could tear down. But when she found a two-bedroom built in 1972, she instead embarked on a massive renovation of the structure. The end result? A LEED Gold–certified urban hideaway that bows to its modernist history, while giving off a distinctly contemporary feeling.